British Standard Wire Gauge is a set of wire sizes given by BS 3737:1964 (now withdrawn), and is generally abbreviated to SWG. It is also known as: Imperial Wire Gauge or British Standard Gauge. Use of SWG sizes has fallen greatly in popularity, but is still used as a measure of thickness in guitar strings and some electrical wire. Cross sectional area in square millimetres is now the more usual size measurement for wires used in electrical installation cables. The current British Standard for metallic materials such as wire and sheet is BS 6722:1986, which is a solely metric standard. SWG was fixed by Order of Council August 23, 1883. It was constructed by improving the Birmingham Wire Gauge. It was made a legal standard on March 1, 1884 by the British Board of Trade. 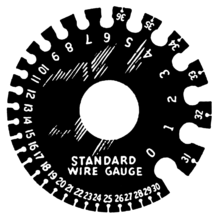 SWG is not to be confused with American Wire Gauge which has a similar but not quite interchangeable numbering scheme. A table of wire gauges and diameters is shown below. The relationship of diameter to gauge is piecewise linear, only approximating a (constant-ratio) exponential curve. IEC 60228, the metric wire-size standard used in most parts of the world. Circular mil, Electrical industry standard for wires larger than 4/0.